Binary/hexadecimal palindromes are integers that are palindromic in both binary and hexadecimal. Unlike binary/decimal palindromes, for example, they have a predictable structure. This means they can be generated directly, rather than searched for. So what is their structure? Certainly they’re made up of the hexadecimal digits that are themselves palindromic in binary: 0, 6, 9, F; for example, F060F16 = 111100000110000011112 and 9F916 = 1001111110012. Each of these four hexadecimal digits maps neatly to a 4-digit binary palindrome, so any hexadecimal palindrome made from them is automatically palindromic in binary. But there are other binary/hexadecimal palindromes, like 52516 = 101001001012 and 7020716 = 11100000010000001112, that contain hexadecimal digits that are not palindromic in binary. In this case, binary palindromes are produced with combinations of hexadecimal digits. It turns out there are a limited number of valid combinations, and that they’re localized — they span only two hexadecimal digits. In this article, I’ll analyze binary/hexadecimal palindromes and describe their structure — a structure due to the relationship of the two bases, binary and hexadecimal. Palindromes starting with 1: only 0 and 1 appear as middle digits. Palindromes starting with 3: only 0 and 3 appear as middle digits. Palindromes starting with 5 or 7: only 0, 2, 5, and 7 appear as middle digits. Palindromes starting with 9 or F: only 0, 6, 9, and F appear as middle digits. Within each of the four groups of palindromes, the middle digits alternate in each digit position, in the order listed above. You can see that binary palindromes starting with hex digits 1, 3, 5, and 7 are not multiples of four bits. This is because leading zeros do not count. Each of those four hex digits — when used as a starting digit — requires less than four bits. In this case, it’s important to remember that hex digits are formed in groups of four bits, from right to left. We’ve seen empirically that a nonzero binary/hexadecimal palindrome starts with the hexadecimal digit 1, 3, 5, 7, 9, or F — now it’s time to prove it. First, observe that the starting hex digit must be odd: an even hex digit ends with a 0 when written in binary, and palindromes can’t start with 0. This leaves eight starting digits as candidates: 1, 3, 5, 7, 9, B, D, F.
Let’s classify our palindromes into two categories: single hex digit and multiple hex digit. A single hex digit palindrome is a single hex digit that is palindromic in binary: 1, 3, 5, 7, 9, and F are the only choices (116 = 12, 316 = 112, 516 = 1012, 716 = 1112, 916 = 10012, F16 = 11112). A multiple hex digit palindrome as a whole is palindromic in binary, but individually, each hex digit may not be — and in fact, will not be — palindromic in binary. Binary equivalent starts with 1. The hexadecimal palindrome will have an associated binary palindrome that is a multiple of four bits. This means that each hex digit must stand alone as a binary palindrome: 9 and F are the only choices for the starting digit. There are two 2-digit palindromes that start with 9 and F: 9916 = 100110012 and FF16 = 111111112; these will serve as “bookends” for all palindromes of 3 digits or more. Binary equivalent starts with 0. The hexadecimal palindrome will have an associated binary palindrome that is not a multiple of four bits. This means that each hex digit does not stand alone as a binary palindrome. The best way to show which starting digits are allowed in this case is to try all four candidates as 2-digit palindromes: 1116 = 100012, 3316 = 1100112, 5516 = 10101012, and 7716 = 11101112. All are binary palindromes, so 1, 3, 5, 7 are the valid starting digits. We’ve seen empirically what the middle digits of multiple digit binary/hexadecimal palindromes are, and that they follow a pattern — now I’ll show why. Definition. I’ll say a number is a leading-zero palindrome or is leading-zero palindromic if it is palindromic with zero or more leading zeros. Palindromes starting with 9 or F are straightforward to analyze, so I’ll start with them. Each middle hex digit must stand alone as a leading-zero binary palindrome, so 0, 6, 9, and F are the choices. The structure of these palindromes is easy to describe. The n+1 hex digit palindromes can be created from the n hex digit palindromes by inserting the digits 0, 6, 9, or F. When n is odd, one n+1 digit palindrome is spawned from each n digit palindrome, by replicating the middle hex digit (which will be 0, 6, 9 or F). When n is even, four n+1 digit palindromes are spawned from each n digit palindrome, by inserting the digits 0, 6, 9, and F in turn. 1 leading zero: 5 (0101) and 7 (0111). 2 leading zeros: 3 (0011). 3 leading zeros: 1 (0001). 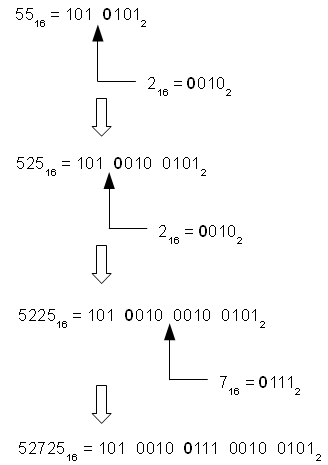 The binary representation of the inserted hex digit must have the same number of leading zeros as the binary representation of the hex digit to its right. The binary representation of the inserted hex digit must be palindromic without the leading zeros. In other words, the inserted leading zeros mirror the existing leading zeros, and the rest of the hex digit — which is between the sets of zeros — stands alone as a binary palindrome. 1 leading zero: 0 (000), 2 (010), 5 (101), 7 (111). 2 leading zeros: 0 (00) or 3 (11). 3 leading zeros: 0 (0) or 1 (1). The insertion of middle digits can continue indefinitely, since the number of binary leading zeros in each group is the same for each digit. Any middle digit in each group can be adjacent to any other. The number of leading zeros in the ending digit is the number of leading zeros maintained throughout. The single digit hexadecimal palindromes 1, 3, 5, 7, 9, and F.
All hexadecimal palindromes that start and end with 1 and have only 0s and 1s between. All hexadecimal palindromes that start and end with 3 and have only 0s and 3s between. All hexadecimal palindromes that start and end with 5 or 7 and have only 0s, 2s, 5s, and 7s between. All hexadecimal palindromes that start and end with 9 or F and have only 0s, 6s, 9s, and Fs between.